The problem with comments seems to have resolved itself. If we used the "show x more comments" link, the MathJax would become unrendered in all comments on that page. However, this is either intermittent or has gone away. After posting, the MathJax is rendered when I refresh. The page will appear fine to anyone who is not editing it, but this makes it very hard to edit. I did some testing and found that the problem only happens when I'm on an anchored page (i.e. when the URL has an #xxxxxx behind it). If I press this link and press 'Edit' then MathJax renders perfectly, but if I press this link and then 'Edit' then it fails and there is no rendering. A quick fix that works for me is to simply remove the '#1458618' anchor from the URL, press enter and then Edit. My settings: Firefox $41.0$ on OSX $10.9.5$ with HTML-CSS rendering. 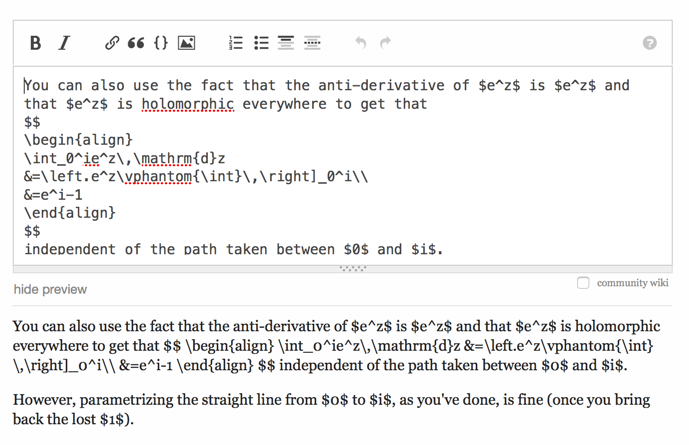 This is a bug in MathJax 2.6 beta, first reported by epimorphic here. It has apparently already been fixed by the developers, but the fix has not yet been deployed here on math.SE. As Winther correctly notes, the trigger is having an anchor identifier (like #1234567) in the page URL. Simply removing any suffix that begins with a # sign from the URL should work around the bug.